Joyce E. (Ash) Gray, age 89, formerly of Bloomsburg, passed away peacefully at the Nazareth Memory Center, Danville, where she and her husband, Harry, resided. 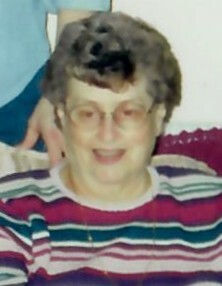 Born in Benton on August 5, 1929, she was a daughter of the late George and Grace (Steinruck) Ash. Her family moved to Bloomsburg during her high school years and she graduated from Bloomsburg High School with the Class of 1947.
responsibilities while serving as Financial Secretary. She especially looked forward to the hoagies made by the Church each year. She also was a member of Bloomsburg Chapter 279, Order of Eastern Star and the Bloomsburg Hospital Auxiliary. In the 1950’s and 1960’s Joyce worked as a bank teller, waiting on customers at the Main Street office of First Columbia Bank & Trust Co. and also at the Market Street branch. In the late 1970’s and 1980’s, Joyce enjoyed interacting with students in the Bloomsburg High School Cafeteria where she worked as cashier. Joyce enjoyed spending summer evenings sitting on the front porch swing, talking with neighbors, and eating Hi Ho’s. She loved growing flowers, especially the chrysanthemums she and her husband grew for their earlier greenhouse business. In later years she cultivated a new batch of zinnias each year in her backyard. Joyce was a relentless competitor when it came to playing board games with her children and cards with friends and family. She participated in a pinochle card club for many years, with couples from Lightstreet and Espy. A birthday celebration wasn’t considered complete unless it included meeting extended family at Perkins for dinner and playing cards. Joyce was preceded in death by her daughter, Denise McHenry (wife of Keith) and by her brother, Eugene Ash. She and her husband, Harry G. Gray, observed their 68th wedding anniversary on July 1, 2018. After raising their two children in Bloomsburg, they eventually moved to the Maria Joseph Continuing Care Community in Danville. Surviving in addition to her husband, is a son, Ronald H. Gray, and his wife Dawn, Wayne, PA; two grandchildren: Jolene, wife of Wes Norton and Kristofer McKeown, and his wife Kayla; two great-granddaughters: Emma and Eland; and a brother, Charles Ash, and his wife Betty, of Middletown. Funeral services will be held on Monday at 11 a. m. in the Good Shepherd United Methodist Church, 101 E. Fifth Street, Bloomsburg, with her pastor, Audrey M. Brosious officiating. Private interment will be in New Rosemont Cemetery, Espy. Friends may visit with the family from 10-11 a. m.
In lieu of flowers, memorial contributions may be sent to Good Shepherd United Methodist Church, 101 E. Fifth St., Bloomsburg, Pa 17815.